Today there are many things to consider when choosing to purchase a new or used car. There's the environment, the running costs and of course, the eventual residual returns after the initial financial investment. AGlaze has been formulated to protect your newly acquired asset over the forthcoming years, protecting the paintwork for up to five years and beyond. During this period, maintenance is minimal as AGlaze does all the necessary protecting for you. The future outcome is now guaranteed, returning top residual value for your original investment and giving you a positive financial advantage when purchasing your next vehicle. 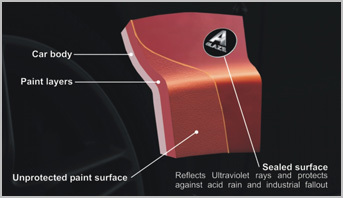 The AGlaze paint sealant system uses the most up to date technology available to provide the best possible protection for your vehicles paintwork. Using a combination of polymers and specialist UV absorbers, the AGlaze sealant ensures full protection against fading, oxidisation and the Suns Ultraviolet rays, as well as repelling acid rain and industrial fallout. AGlaze gives a permanent showroom shine, and reduces the need for washing the vehicle by 50%. No polishing is necessary and AGlaze requires no top ups or conservers to maintain a year round showroom finish guaranteed for 5 years on all automotive paint finishes. AGlaze is currently used by most of the worlds major airlines and is the only paint sealant product that carries Boeing and Airbus certification. The sealant helps protect the aircraft from harsh environments at high altitudes and can extend the paint life of long haul airliners by more than double their regular life span. It also means the aircraft remains easier to clean which therefore reduces down time. 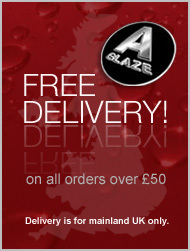 AGlaze is also heavily relied upon within the marine industry and is approved by Sunseeker and Fairline. It has proven to be particularly effective at preventing sun and salt water causing damage to pained surfaces and gel coats.